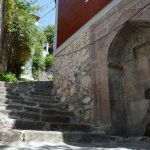 Lesbos (or Lesvos or Mytilene) is a big and beautiful island, with varying landscapes and stone-built villages which make it a living museum of traditional architecture. It has also a rich heritage in traditional music and dance. Fortunately it never became too touristic, so has retained its local character and relaxed atmosphere. Eresos was one of the five city-states of ancient Lesbos. One may see today remnants of the ancient wall and archaeological findings exhibited in the small local museum. Eresos was famous in antiquity for being the birthplace of Sappho, the lyric poetess adored by ancient Greeks. It was also the birthplace of Theophrastus, an important philosopher and natural scientist, who succeeded Aristotle as director of his school. 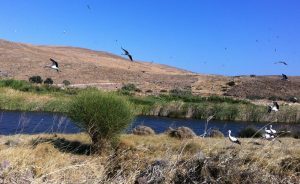 Eresos is about 95 kilometres from the modern city and the airport, or a one and half hour drive by car. It consists of two settlements: the beach village (called Skala of Eresos) and the upper village, which is four kilometres inland on the hills. Impressive mountains surround the green valley of Eresos and its beach, forming a rocky crescent which turns to magenta and indigo at sunset. The sandy beach of Eresos is arguably one of the most scenic in Greece. It is very long (2,5 kilometres), large and clean. It has good orientation, since it faces the south, so the sea is normally calm and clear. Moreover, it enjoys a spectacular sunset. At one end it is flanked by a string of elegant tavernas, restaurants and coffee-bars, with roofed wooden balconies overlooking the sea. At its other end it is quiet and sparsely frequented, ideal for those who seek isolation and serenity or nudism. Lesbos has a rich culinary tradition, combining the best features of Greek and eastern cuisine. 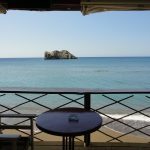 Food is excellent in Eresos and at half the price of what one pays in touristic islands. Moreover, it comes in impressive variety: many vegetable dishes cooked in local olive oil are offered along the meat and fish dishes. 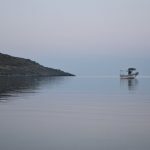 Fish is not a luxury in Eresos; it is low-priced and abundantly provided by local fishermen and fish mongers. Shops of all kinds sell groceries, fruit, meat and cheese, for those who like to organize their own household. 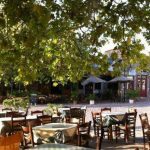 Above all, what distinguishes Eresos from other places in Greece is its atmosphere: unconventional without being pretentious, it combines the traditional ways of a hospitable Greek village with the most liberal attitudes of modern cosmopolitanism. In Eresos, families may live happily together with couples and single travellers. Entertainment is generally low-key, satisfying those who want to stay on late without depriving others of a peaceful sleep at night. It is a distinct and secluded world, inspiring a very strong sense of place. There is a public doctor at Eresos and a pharmacy. A medical centre at the village of Antissa, 20 minutes by car from Eresos.